You want to take advantage of all the new innovations in application development and delivery, from public cloud to containers and microservices, to make the most of your applications. But until now that’s meant having to choose between development on premises or in the public cloud ‒ having to compromise with monolithic “stacks” or being challenged to “glue” different parts together. It also meant more complexity, with more silo’d environments, technologies, teams, and vendors that won’t always work well together. The result has been cost, risk, and lack of freedom. It doesn’t have to be this way. 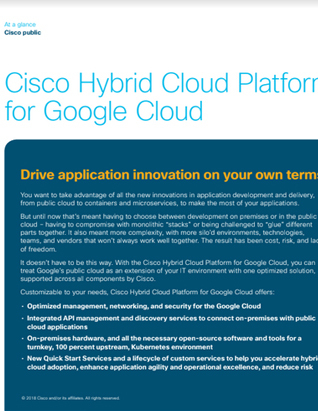 With the Cisco Hybrid Cloud Platform for Google Cloud, you can treat Google’s public cloud as an extension of your IT environment with one optimized solution, supported across all components by Cisco.